No swings, teeter totters or anything above a blade of grass…artificial grass. 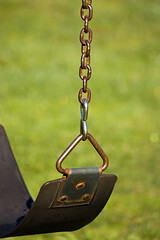 removed because of insurance issues and lawsuits stemming from swing-set injuries. In the past two years, the school district has settled two swing-set claims and is fighting two swing-set related lawsuits. Why? Why is it the school systems’ job to keep kids safe? There is a difference between falling down or falling off a swing and being kept safe. This is not an issue where young children are being put at risk. At what point in time do we start putting kids in bubble wrap before sending them out the door. See Risk Management: Preventing Injuries or Preventing Lawsuits? for more of my comments on this idea. It is this quote that sent me through the roof! Many of the county’s elementary schools use mulch around their swing sets, although national safety standards now call for rubber-based surfaces, Stewart said. Those types of surfaces can cost at least $7,500 per swing set, he said. A new standard created by some do gooder group has forced the removal of swing-sets from the school yard. Sure rubber surfaces are better but not everyone can afford one. All the creation of this standard did was eliminate swing-sets not keep kids safe. At least it is going to be a standard that will eventually be obsolete because no on will have a swing set. A commercial swing-set with four swings costs a playground about $1000 to $1500. However, when you add the cost of the rubber matting the total price of a swing-set is $9000! Or roughly 6 swing-sets. When I said flat ground? The swing-sets are not going to be replaced with anything because the school district no longer deals with playgrounds. The dictionary will have to change its definitions; playground will now be a synonym for field. For more articles about how ridiculous standards are see Can a Standard Impede Inventions?, Basics of the Article are Good – But it confuses certification, accreditation and most importantly standards. and This is how a standard in the industry changes…..but….